Oh hi, it’s me again, forgetting my camera all over the place and bringing you magical iPhone fauxlaroids of my detours through Detroit history. Friday afternoon was a good afternoon for a bike ride to Woodlawn. Sunny and crisp and the perfect little waltz out of a stressful week. 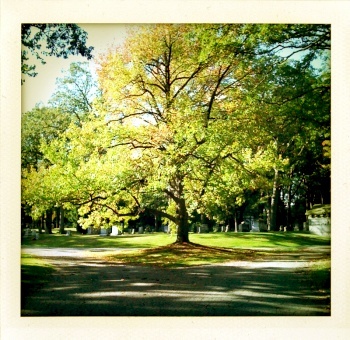 In lieu of writing your face off today, I just wanted to share a couple nice things I noticed on my lazy pedal through the fall-tinted grounds. For instance: Look how pretty these are. 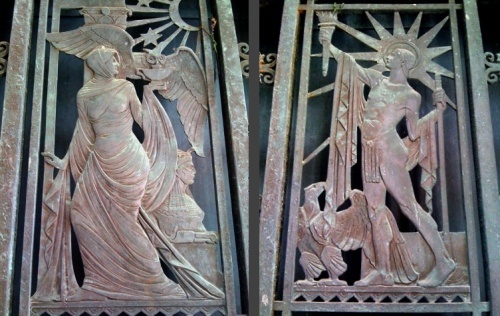 Athena and Apollo, right? I love the owl. 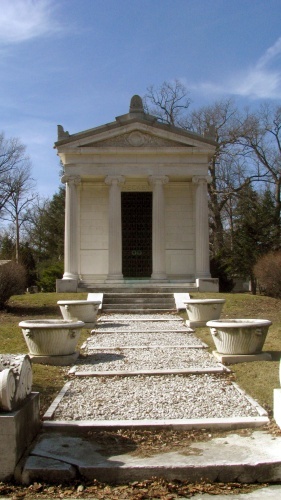 We visited Colonel Frank Hecker on our last trip to Woodlawn, but subsequent to this visit, we learned (from the Arcadia Press book on Woodlawn by A. Dale Northup) that Stanford White designed his kingly crypt, which is the only one in the cemetery made from marble rather than granite. Stanford White? He was the architect who was shot in the face by comely actress Evelyn Nesbit’s jealous husband, leading to 1906’s “Trial of the Century,” which you’ll remember if you’ve ever seen the musical/watched the movie Chicago. Oh, that Stanford White. Yep. And then we saw this lady. She looked a little familiar. Oh, it’s because we’ve seen her before! At the door of Frederick J. Fisher’s mausoleum at Holy Sepulchre Cemetery in Southfield. She must have been a popular usher into the afterlife. This one belongs to Charles Bohn, of Bohn Aluminum and Castings. Fisher died in 1941, Bohn in 1953. 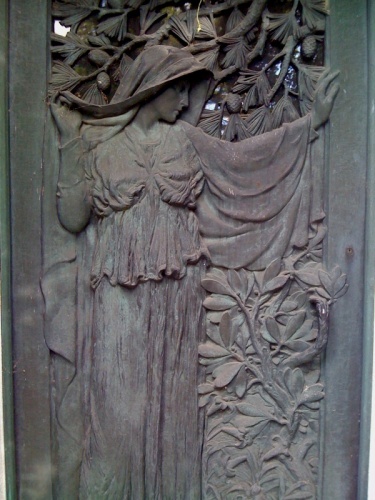 The brass relief sculpture was designed by Robert J. Hill, creative director of Gorham Brass, and sculpted by Ben Johnson. I still think it is really something, even though I now know it to be less than an original. And no visit to Woodlawn would be complete with saying your respects to the Governor. More on Hazen S. Pingree, Idol of the People, later this week, if all goes to plan. And more cemetery bike rides before the weather turns! I have spent a lot of time in the Michigan woods and have seen just about every animal that lives here, except for a fox. I’m jealous. 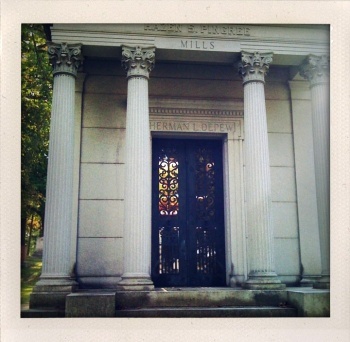 By the way, were you standing at the entrance gate to the Jewish cemetery in Ferndale later that evening? When I first saw it, I thought it was a coyote, as I had just read an article about coyotes that SOMEONE shared on Facebook. Oh, right, it was you! But it was definitely a fox. It took the little dude a long time to notice me, but as soon as he did, he bolted. And no, I don’t think that was me! I was taking photos earlier this month in woodlawn and spotted a coyote about a hundred feet in front of me, it didn’t stop its trot and I followed for a minute but it ducked into a seculded crypt and I decided not to follow. I have seen alot of wildlife there such as herons, turtles and now coyotes. I love it. Did you know that A Dale Northup died the same week that his “Detroit’s Woodlawn Cemetery” book was published? A great loss to us all.